is a giant mechatronic animae character and has been realized by the producers of the Gundam Japanese TV Show; an animation series which started in 1979 about a future where robots or mecha Gundam's piloted by humans battle for supremacy over the evil doers. 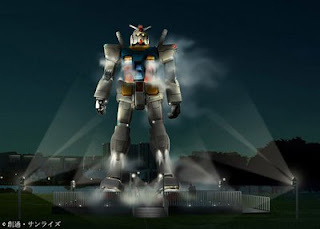 It stands 18 meters tall, the scale model was put in place to mark the 30th Anniversary of the anime's beginning.The Gundam model has 50 points of light, emits steams, and its head revolves left to right and up. Here is IDG News media's video after it was tested in Odaiba. Another video captured at the opening ceremony recently where we are treated with an introduction to the on site food stalls. But if you prefer here is the Geeks Guide to Gundam, plus you may like to read further , or even more.